Every hobby begins with a single step; start off on the right foot with a Kato UNITRACK Starter Set! Each starter set comes with a complete oval of track, a Kato Power Pack, a locomotive, three cars, a re-railer, and an instruction book on how to assemble and care for your new Starter Set. From then on, the sky's the limit thanks to UNITRACK 's modular snap-track design. Build a complex basement layout, or keep it simple so that you can take it out in evenings; anything is possible with UNITRACK ! 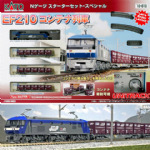 Kato 10-005 Series Steam Loco D51 & Coaches Starter Set.